Whether it was being at the Fish For Life Cruise yesterday or being at Lost Valley, it gave me a moment of pause to really reflect upon my own blessings. The challenges many of us have pale in comparison to the challenges of those on the Fish For Life Cruise. On the cruise, I was assigned as a Team Leader to support two Special Needs Families. I did not dwell upon the exact nature of the challenges each child had--all I tried to do was to encourage them while frankly overwhelmed by it all--whether it was the Mother who had to struggle to cover the cost of the special milk for her child or the Father who was trying to rebuild his life and connect back with his Son. As I awarded the Fish For commemorative medal to my team, the scenes were just unforgettable. I was also so impressed to have met the 22 year old Founder of Just For Me Foundation who realized a need to be a bridge for Special Needs Children and has done something about it. This is as I also met a co founder of the GrandMothers Autistic Network that strives to help Autistic Children. As I drove back from Lost Valley this morning, I could not help but be in awe at the true selfless souls that have left such a legacy there. Whether it is Dr. Arnold Beckman or all who have helped build out the cabins where the staff lives or all the volunteers who serve there, it is just a site to see. It will test anyone's driving skills--but well worth the try!! This is a week also that June is winding down--and July 4 celebrations are before us. My hometown of Laguna Niguel is no exception as the annual Run in the Park is on tab along with the beautiful fireworks. But there is also a very important event on tab--the unveiling of the Freedom Sculpture at a free ceremony on July 4 in Los Angeles. As noted on the website, "...The Freedom Sculpture, will be a “Statue of Liberty” for the West Coast -- A crowd-supported public monument that will be gifted to stand in the heart of Los Angeles. 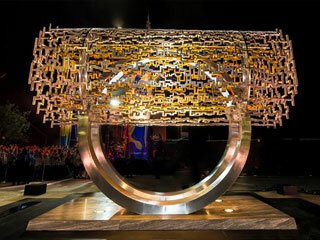 It is inspired by the humanitarian ideals of freedom, respect for cultural diversity and inclusiveness that originated with Cyrus the Great of Persia 2,500 years ago and which have been enshrined in the U.S. Constitution for all by the Founding Fathers. The Freedom Sculpture will be officially unveiled in a citywide celebration on July 4th, 2017. It will stand from that day on as a reminder of the universally shared values that truly make America great....". I had the pleasure to make a very token contribution to it. Unfortunately, I cannot go--but I do look forward to seeing it real soon after it is officially unveiled. Over 1 Million People have contributed almost 2.3 Million Dollars to help make this a reality!!! As I gear up for this final week of June in support of the work of the Daily Outsider and other projects, it is witness to such that makes me ever so hopeful. Onward to the final week of June as I wish all a fabulous week and a great 4th!! !